On January 16, 2019, ISIS carried out a suicide bombing attack in the northeastern Syrian city of Manbij, apparently targeting an American army patrol which included Kurdish fighters. Nineteen people were killed, four Americans, five Kurds and ten civilians. The attack was carried out during the American-Kurdish withdrawal from the city. In ITIC assessment, behind the attack was ISIS’s desire to show that the American withdrawal from Syria is the result of the attacks and casualties the organization has inflicted on Americans and their Kurdish allies. The suicide bombing attack was carried out by ISIS although it is under severe pressure. Its enclave east of the Euphrates is shrinking and is about to be destroyed by the Kurdish forces (with coalition support). The attack was ISIS’s response on the ground to Donald Trump’s declaration that the organization had been defeated, proving that ISIS’s campaign was not over and is only beginning. It can be assumed that ISIS operatives and supporters will make an effort to accompany the American withdrawal with attacks on American targets in Syria and Iraq, and with ISIS-inspired attacks carried out by supporters in Western countries. 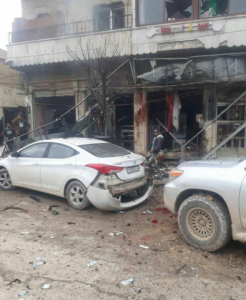 At around 12:30 in the afternoon on January 16, 2019, a suicide bomber blew himself up in the city of Manbij, northeast of Aleppo (on the western side of the Euphrates). Until recently the city and surrounding area had been controlled by the Kurdish forces (through a local military council under American aegis). Following Trump’s declaration of the defeat of ISIS, American and Kurdish fighters began withdrawing from Manbij. However, the withdrawal has not been completed and the situation on the ground is fluid. Syrian army and Russian military police forces are deployed in the regions around the city in order to restore control of the city to the Syrian regime at the end of the American-Kurdish withdrawal (challenging the Turks, who also aspire to take control of Manbij and its surrounding areas). ISIS has no control over Manbij but ISIS sleeper cells may be operating in and around the city, as they operate in other cities and regions liberated by the Kurds with American and coalition support. Assuming the attack targeted an American patrol (as yet unverified), it was the first suicide bombing attack carried out in Syria against a target affiliated with the United States and the coalition countries. The American media reported that prior to the current attack, since 2014 only two American service members had been killed in action in Syria (CNN, January 17, 2019). The attack in Manbij was carried out by an ISIS operative who blew himself up with an explosive belt in front of a restaurant (called The Palace of the Princes) on a busy market street in downtown Manbij. The American army reported that ISIS had claimed responsibility for the attack. According to the report, the attack targeted a routine American army patrol (as yet unverified). Nineteen people were killed: four Americans (two of them civilians), five local Kurdish fighters accompanying them (possibly members of the Manbij military council which controls the city) and ten civilians. The number of fatalities may rise because of the critical wounds inflicted by the blast (Syrian Observatory for Human Rights, January 16, 2019). The American army is investigating the circumstances of the attack (CNN, January 17, 2019). Right: The front of The Palace of the Princes restaurant where the suicide bomber blew himself up. 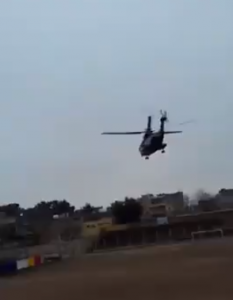 Left: Helicopter (apparently American) evacuates the dead and wounded (Drexl Spivey@RisboLesnky Twitter account, January 16, 2019). The initial response came from an anonymous senior American figure. He reported that four Americans had been killed in the attack and three wounded (relating only to American casualties) (Reuters, January 16, 2019). No further official information was provided. On January 17, 2019, CNN, based on statements from American administration officials, reported that the fatalities were two American service members, a Department of Defense contractor and a civilian Department of Defense employee. According to the report the civilian is an intelligence expert who accompanied the American force to collect information (CNN, January 17, 2019). ISIS claimed responsibility for the attack. According the claim, the attack in Manbij targeted a patrol of the international coalition countries, and was carried out near The Palace of the Princes restaurant. A suicide bomber, known as Abu Yassin the Syrian, blew himself up with an explosive belt. ISIS claimed nine “Crusaders” (ISIS nickname for Christians in general and American Christians in particular) were killed in the attack. The claim did not relate to the civilians who were killed (A’maq, al-Sham-Aleppo Province, January 16, 2019). In ITIC assessment, the suicide bombing attack in Manbij is liable to have an influence on the pace of the withdrawal of the American soldiers from Syria, and on the complex, fluid situation in Manbij and its surroundings. It is possible that a mass-casualty attack will make the withdrawal faster, out of concerns for the security of the forces, or may make it slower, for the same reason. In ITIC assessment, any decision the Americans make will influence the situation in Manbij and its surroundings. Tensions may rise as the date for the final withdrawal approaches, in view of the Syrian regime’s intention to put Manbij and its surrounding under the control of the Syrian army (with Russian backup). However, that immediately challenges Turkey, which aspires to include Manbij into the “safety zone” it seeks to establish along the Syria-Turkey border (which Turkish President Erdogan recently discussed in a phone conversation with Donald Trump).